Today New Zealand’s Parliament has a single chamber, the House of Representatives (the Lower House). Between 1853 and 1950 there was a second chamber, the Legislative Council (the Upper House). The members of the Legislative Council were appointed – initially for life, although most resigned before their demise. Its major role was to amend or reject bills which had been passed by the House of Representatives. As New Zealand’s equivalent of the British House of Lords, the Council was intended to play an important oversight role. But in practice it had little to do. Once governments appointed its members – a role they soon took from the governor, although he still approved the nominees – the Council had little independence. If it proved troublesome, the government of the day could simply appoint new members who supported its policies. The big showdown came in 1891, when the Council obstructed the radical policies of the new Liberal government. An attempt to stack the Council backfired initially when the governor refused to approve the nominees; his superiors in London finally ordered him to co-operate. From then on the Council existed mainly to reward members of the House for loyal service. From the 1890s members were appointed for renewable seven-year terms. In August 1947, National Party leader Sidney Holland introduced a bill to abolish the Council, which was widely seen as no longer serving any useful purpose. This was defeated in the House, partly on the grounds that New Zealand lacked the autonomy from the United Kingdom to take this action. The dominion's ratification of the Statute of Westminster in November 1947 removed that impediment. National won the 1949 election on a platform which included abolition of the Council. During 1950 Holland appointed 29 new members, restoring it to its full strength of 53. Dubbed the ‘suicide squad’, the newcomers had all promised to support the Legislative Council Abolition Bill. 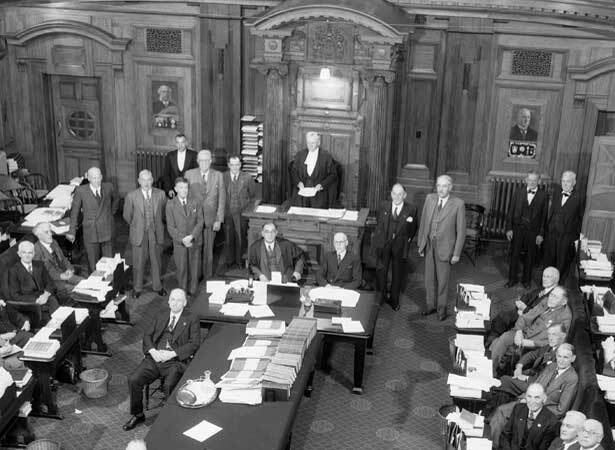 The Council sat for the last time on 1 December 1950 and the Act came into effect on 1 January 1951. No one was too upset at its demise and few people turned up for the occasion. When the end came, Council members linked arms in the centre of the chamber and sang ‘Auld Lang Syne’ and the National Anthem before filing solemnly out for the last time. We have 8 biographies, 5 articles, related to Legislative Council abolished.